Back to school is here for some, and right around the corner for others. This fall I will be taking on a full load of classes as well as a full time medical internship, which means I will be short on one major thing until Christmas: time. Short on time, however, does not mean skip breakfast (for me, at least). I’m that girl who wakes up needing food ASAP or else I quickly turn into a monster & lose my ability to function. 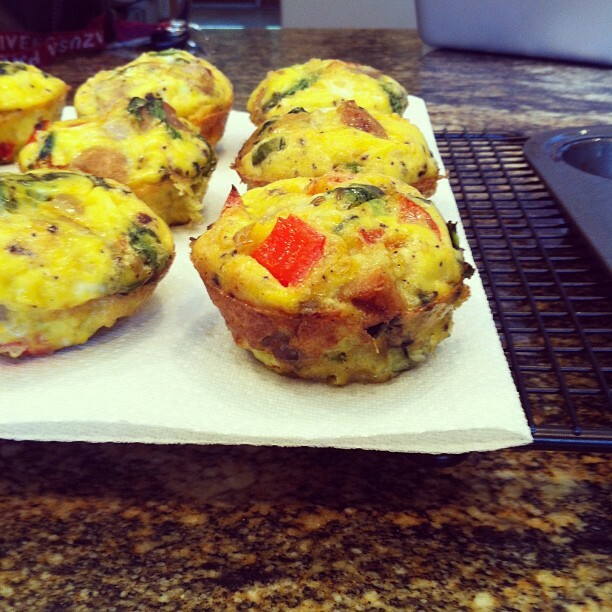 These cute little breakfasts are a great solution if you’re anything like me. Whip up a batch (or two) on a Sunday, wrap ‘em up in foil, and have breakfast ready for the week. These mini omelet cups can be prepared at least a hundred different ways, but this recipe is one of my favorites. I use a few of the ingredients that I always have on hand, & let out a little of the Italian in me. Feel free to change up your meats & veggies according to your own tastes- they will be awesome regardless! Chop the sausage into bite size pieces. Sauté the sausage with bell pepper & onion until the veggies soften, about 3 minutes. Turn off the heat & stir in the spinach and basil. 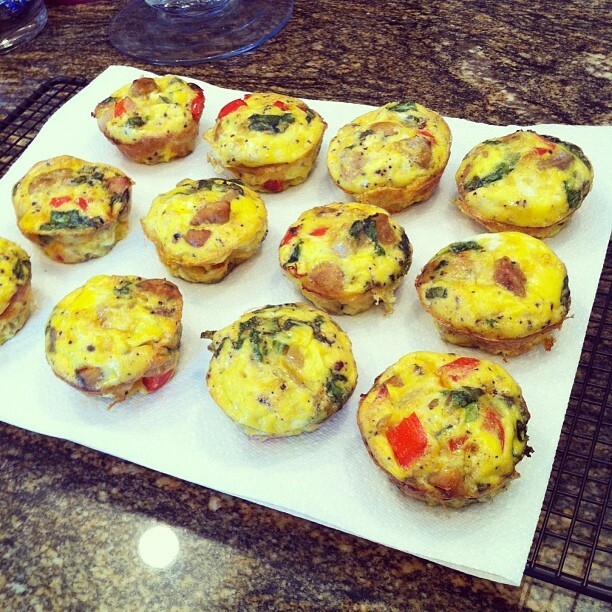 Grease a 12-cup muffin tin with coconut oil spray, and spoon the meat & veggie mixture into the cups. In a large bowl, combine the eggs with the garlic, salt, pepper, & red pepper flakes. Scramble the eggs, and pour over the meat & veggies. Bake for 25 minutes, or until they puff up & feel slightly firm to the touch. *Makes one batch of 12. That's it! You can eat them all in one sitting if you're having guests, or easily wrap them up & store in the fridge. I usually reheat mine for about 30 seconds in the microwave before running out the door when I'm in a hurry. Enjoy~ & let me know what you think! These are so delicious! (Even though I made some modifications and left a few things out)I wanted a recipe that I could use up some of the leftover ham I had from Christmas and the omelet recipe I used to make was full of cheese and unhealthy stuff. So even though ham isn't the most healthy meat I thought your recipe would be a great healthy alternative to try. So I substituted ham for the sausage and I also didn't have enough money to get basil and red pepper flakes but despite that they turned out great! Simple ingredients and great taste, I didn't need all that extra cheese to have a flavorful egg meal. I can't wait until I will be able to try your original recipe with the trader joe's chicken sausage you describe and all the ingredients next time :) Thanks for posting! @ Lori~ So glad you enjoyed these! I agree, this is a great recipe to use up any leftover meats/veggies you've got on hand. 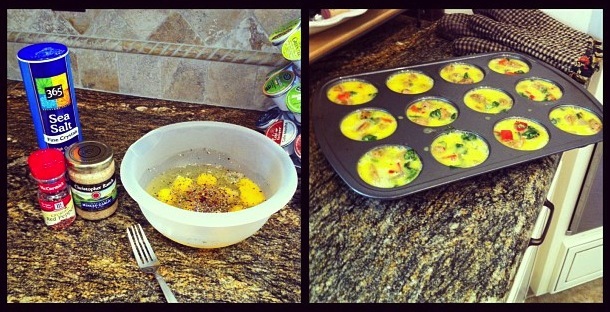 In step 8 you say to scramble the eggs before you pour them into the muffin cups. Did you mean to whisk the eggs? I scrambled them the first time I tried this recipe and it didn't work. Hi Beth! Yes, I suppose "whisk" might have been more clear. So sorry about that. They should definitely be raw to cook in the oven. Apologies for the confusion! I kind of live on these and have been making a batch almost weekly for the past few years. I don't cook anything beforehand and use uncooked sausage, so I leave them in the oven longer than yours. But I just love the idea of these and that there are so many variations, not to mention they are so dang convenient! Sometimes I eat one or two for dinner with salad and/or vegetable. Glad you love 'em Luana! They are so versatile, aren't they? & Great idea on serving them w/ a salad for dinner! Thank you! Can these be frozen? As I am trying to bring healthy variety into my breakfasts. My husband loved these! Thanks for posting.